And now for a little Breaking news. Inside sources are reporting that the feature film continuation of Vince Gilligan's Breaking Bad will drop first on Netflix before heading to AMC, the network that aired all five seasons of the iconic series. The news was reported by Deadline. This would be an interesting reversal of the way that the series first aired, with each season dropping episodes weekly in a standard broadcast TV model before heading to Netflix for the world's binging pleasure roughly a year after the conclusion of each season. While Breaking Bad was always critically acclaimed, it took a little bit for audiences to catch on, and Gilligan has said in the past that that might never have happened if not for AMC's deal with Netflix. In 2013, shortly before the series finale aired (and just after picking up an Emmy for Best Drama), Gilligan said, "Television has changed a lot in six years. I'm no expert on the sociological elements of it, but I've got to think a big part of what has changed is streaming video on demand, particularly with operations like Netflix, iTunes and Amazon Prime. I think Netflix kept us on the air… I don't think our show would have even lasted beyond season two [if not for Netflix]. It's a new era in television, and we've been very fortunate to reap the benefits." That being the case, the Breaking Bad feature (which may or may not have the working title of Greenbrier) landing on Netflix would constitute a hearty "thanks a lot, guys," to the streamer, as the series still retains a rabid fan base — one that is, in fact still growing despite the fact that new episodes haven't been broadcast for over five years. A 2014 analysis pegged Breaking Bad as the most binge-watched show of all time, and in 2016, Netflix named the series among those binged the most quickly after analyzing over 100 TV series across its service in more than 190 countries. It's pretty safe to say that the numbers for any new continuation of the series' story would be absolutely through the roof; we're going to go out on a limb and say that Greenbrier (or whatever it ends up being called) could potentially destroy the numbers posted by Bird Box, the viral hit flick which Netflix reported was watched by some 45 million viewers in its first week alone. 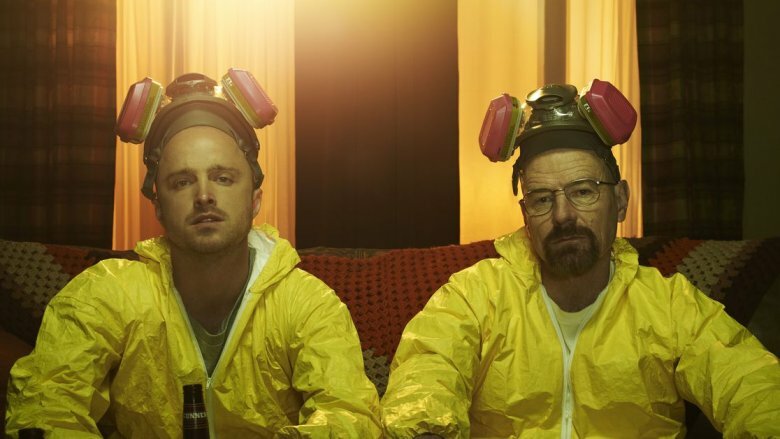 So far, neither Bryan Cranston (Walter White) or Aaron Paul (Jesse Pinkman) have been confirmed to be returning for the new movie, although at least one of them appears to be a shoo-in. The (very brief) synopsis for the flick revealed that it will follow "the escape of a kidnapped man and his quest for freedom," which seems like it pretty much has to be describing Jesse, who spent a significant amount of time during the final season kidnapped by a vicious gang before being liberated by Walter in the series finale. Gilligan also seems to have been contemplating Jesse's fate for a pretty long time. In an interview with GQ not long after the finale aired, he stated that "it's up to the viewer to decide what happened to Jesse" before immediately appearing to backtrack. "My personal feeling is that he got away," he said. "But the most likely thing, as negative as this sounds, is that they're going to find this kid's fingerprints all over this lab and they're going to find him within a day or a week or a month. And he's still going to be on the hook for the murder of two federal agents. But yeah, even though that's the most likely outcome, the way I see it is that he got away and got to Alaska, changed his name, and had a new life. You want that for the kid. He deserves it." We'll soon see whether Gilligan has been hanging onto that notion for all these years. He wrote the film and will also direct; producers Mark Johnson and Melissa Bernstein, both of whom worked on the original series and the spin-off Better Call Saul, are also on board. Obviously, Gilligan and company are keeping details close to the vest, but we'll be here to report any and all additional details as they become available.